Exclusive! The ultimate in comfort and style! 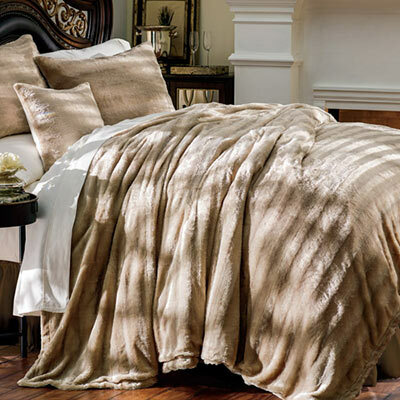 Luxury faux fur bedding and accessories are the pinnacle of elegance and add a sophisticated look and feel to any room. Exceptionally woven from the finest materials for a sumptuous plush feel and color variations of genuine fur. Reverses to solid fleece liner. Polyester. Dry clean for best results. Imported. Twin - 68" x 86"
Full/Queen - 86" x 86"
King - 100" x 90"
Pillow Cover - 18" sq. Throw - 50" x 60"